The practice offers confidential advice and service covering family planning. From 1 April 2015 the practice will no longer be able to fit and remove the IUCD (coil) and the Nexplanon implant for contraception. Instead, patients will be referred to Conifer House to receive these services. This situation has arisen as a direct consequence of the Health Reforms which transferred the responsibility for commissioning of Public Health Services to the local Councils. The revised terms of the contract offered to practices from 1 April 2015 are such that it is unsustainable for us to continue. Quite simply, the cost of providing the service is far greater than the revised terms we have been offered. With great regret, therefore, we have been unable to accept the contract to provide these services in the practice with immediate effect. This decision has not been taken lightly and has far reaching implications for clinicians as well as for patients. In order to maintain their skills, clinicians must fit a minimum number of devices each year as well as undergoing regular updates and re-validation. These skills will be lost over time as we cease to provide the service. Patients can still see their GP for sexual health advice and we will continue to discuss all available methods of contraception. Whilst we can continue to provide the oral contraceptive pill, condoms and the 3-monthly depo-provera injection, patients whose preference is for LARC (long acting reversible contraception) will need to attend Conifer House for fitting of coil or implant. Please note that if you currently have a device fitted, we will no longer be able to remove this and, again, it will necessitate a referral to Conifer House. Morning after pill service is provided from all our surgeries and from Withernsea Hospital. All doctors provide maternity care in co-operation with the community midwives and health visitors. Various options for maternity care are available; you may wish to discuss these with your doctor or midwife. Always bring a urine sample in a clean bottle to the clinic. Smear tests for women are intended to detect changes before cancer develops in the cervix (neck of the womb). The changes can be treated and cancer prevented. We recommend that all women between the ages of 25 – 65 should have regular smear tests unless advised to the contrary by the doctor. The practice nurse carries out smears. A reminder is sent when your smear is due. If you wish to be excluded from the cervical smear screening programme, please come and discuss it with the practice nurse. Please do not just ignore the letter. If you still wish to be excluded from the screening programme you will be asked to sign a form to inform the health authority of your wish. The smear result will be posted to you directly. Minor operations are offered by arrangement with your own doctor. For legal reasons, an adult must accompany anyone under 16. You will be asked to sign a consent form. These are held every Thursday at 2.00pm at St Nicholas' Surgery. For your convenience, practice nurses will give childhood vaccinations at any of their general clinics at all our surgeries. 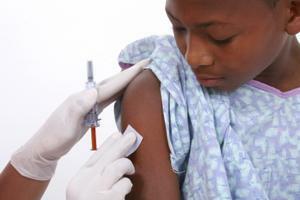 You can get information on the childhood vaccination schedule in the health & lifestyle section on this webpage. All babies registered with the practice will receive an appointment by post to see a doctor shortly after the age of six weeks. The health visitor will carry out other child health surveillance on the basis of need. The doctor will see children at the request of the health visitor or parents should a developmental concern arise. Cryotherapy clinics are held at St Nicholas' Surgery for the treatment of warts etc, you must see a doctor first for an appointment. Diabetic clinics are held at all surgeries. Sister Guy runs them. Diabetic patients are invited to attend for regular check-ups. It is important to attend for monitoring, advice and support. Practice nurses are always available for additional advice. Once a year diabetic patients are invited to attend the retinal camera screening. This is extremely important to prevent visual impairment and blindness. It is important that you attend the clinic even if you are seeing your own doctor regularly. Asthmatics are invited to attend the clinic once a year for assessment and adjustment to your treatment. It is important that you attend the clinic even if you are seeing your own doctor regularly. Patients suffering from COPD are invited to attend the clinic once a year for assessment and adjustment to your treatment. Lung function tests (spirometry) are done at regular intervals. It is important that you attend the clinic even if you are seeing your own doctor regularly. Please remember to bring all your inhalers with you. The surgery provides a number of additional CDM clinics e.g. coronary heart disease, stroke, hypertension, epilepsy and mental health reviews. Patients will be invited to attend. It is important that you attend the clinic even if you are seeing your own doctor regularly or attending hospital. Much of the management of CDM clinics is now linked with our Long Term Conditions Clinic you can find out more about this clinic on this website. If you are not on a regular review and would like a health check, please request an appointment. All GP practices are contracted to provide Essential Services, that is, basic treatment of ill people. The practice has developed a new innovative approach for managing patients with Long Term Conditions. If you have asthma, COPD, diabetes, ischaemic heart disease, epilepsy, high blood pressure, heart failure or have had a stroke/TIA you might receive an invitation to this new clinic. The project is currently targeted at those patients who have more than 1 of the above problems but hopefully will be rolled out to all patients with Long Term Conditions in future years. The clinic consists of one single longer appointment for all your conditions. Prior to the appointment you will be sent a Health Needs Assessment form to complete so we can concentrate the appointment on the areas which concern you the most. A GP & the practice pharmacist will also review your record; before your appointment; and might make suggestions to the practice nurse to improve your care. The appointment will focus on increased education, creating personal goals & encourage self care/management. As part of the appointment you will create an agreed personal care plan for the next 12 month period. If you want to find out more about your condition and how you can help manage it the is lots of useful information available on this website. Please visit our long term conditions section. The surgery recently won a Royal College of General Practioners Enterprise award for the clinic. You can find out more here. The practice nurses provide advice and vaccination for all foreign travels. Please complete a holiday questionnaire (available from reception) and return it to the surgery at least eight weeks before you intend to travel. The nurse will then check if you require any vaccinations and any necessary appointments can be made. Please note from 1st May 2014 we will no longer offer Yellow Fever Vaccinations. Some vaccinations may incur a charge. If you require Malaria medication we will provide a private script for you to take to a pharmacy of your choice. This enables you to shop around for the best price. From time to time you may request a report, letter, certificate or medical examination from your doctor. This is outside the core medical services provided by the NHS. You will be asked to pay for these services upfront. Unfortunately we are unable to commence work on reports until the fee has been paid. Please ask at reception for a list of fees. We work closely with the Health Trainer Team. They run clinics at Withernsea in the Leisure Centre and also at our Branch surgeries. You can self refer to see them and do not need a Doctors referral. They provide personal support and motivation to adults within the East Riding of Yorkshire who wish to lead a healthier lifestyle. If you want to become healthier but don't know where to start, a health trainer will be able to help you work out exactly what you want and how to go about it. They can help you access support from other health partners. To find out more about the East Riding Health Trainers please click here. An experienced addictions nurse attends the surgery weekly and can help patients who may have difficulties with the amount they drink. Your GP can organise an appointment to see her. The NHS Choices Website provides lots of useful information on alcohol by clicking here.